Streamline Payements offers a multitude of credit card processing services to thousands of merchants throughout the country. The company’s growth over the last decade can be attributed directly to the experienced industry professional representatives it employs. Their relationship building skills have allowed the company to earn multiple endorsements from banks, associations and local chambers of commerce. Streamline is heavily focused on the Business to Business merchant segment which made this agreement with Unistar such a natural fit. Streamline Payements has software developers on staff to provide customizable solutions for their clients. Their software solutions help businesses reconcile easier, reduce cost, eliminate risk and advance their receivables. Streamline Payments is a full-service payment processing company offering a wide array of services to merchants of all sizes throughout the country. 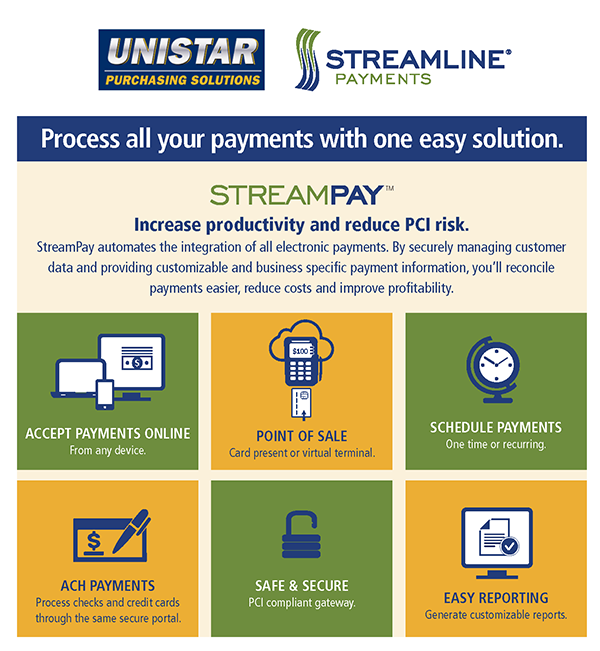 Streamline Payments only utilizes the nation’s most reliable card processing platforms. They offer next day funding for all card types and product offerings to fit every merchant segment. Their highly customizable software provides solutions and efficiencies directly to the B to B merchant segment.